Japan’s cabinet ministers approved new long-term national defense guidelines that includes the largest ever defense budget for the next fiscal year. The latest guidelines express “strong concern” over an “uncertain regional security” situation posed from China’s military expansion in regional waters. A mid-term defense plan also endorsed setting aside $240 billion over five years beginning in fiscal 2019 to pave the way for beefing up weapons and defense equipment. 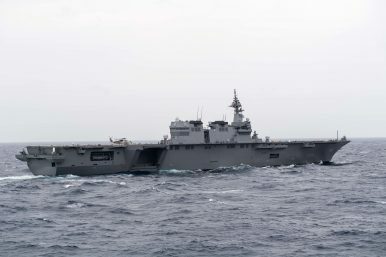 Japan’s military wish list prioritizes the upgrade of two self defense force ships with “offensive” aircraft carrier capabilities — mainly to accommodate F-35B stealth fighter jets on board. The defense build up program carries a hefty price tag of 5.26 trillion yen ($48 billion dollars) — the highest figure for the seventh consecutive year signalling a sudden shift from a post war self-defense only posture. When Prime Minister Shinzo Abe first came to power in 2013 the defense guidelines were drawn up as a 10 year plan. But the Abe administration has revamped the nation’s conventional land, sea and air defense systems five years ahead of schedule to deal with burgeoning cyber security threats and competitive outer space military expansion. The new defense guidelines introduced the ambiguously worded “multidimensional joint defense force” concept, which stresses the need to invest in more technologically advanced domains of warfare. The government dismissed claims of unconstitutionality justifying that fighter jets will not be assigned on navy ships permanently despite the refurbishment and will be deployed during large scale disasters and patrolling missions. With efforts to reassure the public, Chief Cabinet Secretary Yoshihide Suga said the measures aim to reinforce air defense systems within “the minimum necessary level of force permissible” under the pacifist constitution. Japan is also facing growing pressure from the Trump administration to shoulder more of the financial burden of protecting national security not to mention additional strain to reduce the bilateral trade deficit between Japan and America. Therefore, purchasing American made defense equipment directly from the U.S government is seen as a way to appease Trump’s “America First” trade policy and guard against worsening economic relations and the potential of a retaliatory trade war. Japan has already placed an order for two long range Aegis Ashore missile interceptors worth an estimated $1.2 billion dollars each to defend outlying islands along with nine E2D early warning detector aircraft valued at $3.13 billion dollars. Defense Minister Takeshi Iwaya appealed for public understanding calling the new equipment outlays as “indispensable” to protecting Japan while also highlighting that the costs negotiations with the U.S. that are ongoing for bulk purchases are a way to cut overall costs. The price of these expensive weapons will be settled with a U.S government long-term payment contract under the Foreign Military Sales (FMS) plan to moderate Japan’s defense spending bills. Although Japan’s spends 1 percent of its GDP on defense expenditure — which is on the lower end among developed countries — an ageing population and dismal population trajectory could see future generations crippled by debt repayments. The urgent rush to acquire arms capable of attack has invited criticism over unclear intentions which the ruling coalition has repeatedly maintained as constitutional simply through the defense guidelines’ ambiguous wording. Meanwhile, the lack of political debate surrounding the effectiveness and advantages of upgrading to “attack” capabilities have also raised eyebrows for going against the Japan-U.S. security alliance division of military powers that assumes Japan as a ‘shield’ and the U.S as a ‘sword’. The push to secure aircraft carriers — a move not seen since World War II — is expected to be challenged by oppositions parties when the ordinary Diet session reconvenes early next year as a contradiction to the constitution’s war renouncing article 9.